You’d have to know if USB 2.0 will be replaced by USB 3.0 started in 2010. USB 3.0 data transfer speeds of about 3200 Mbits/s (3.2 GBits/s or 400 Mbytes/s), and in theory can achieve 4.8 Gbit/s. This speed is 6 to 10 times faster than USB 2.0 maximum speed. USB 3.0 data transfer technology introduces two-way (full duplex), so it can read and write data simultaneously (simultaneously). USB 2.0 and earlier do not support this bi-directional technology. Electric voltage is derived from 4.4 V to 4V, then the flow also improved (to 150mA), so in addition to more energy efficient, a USB 3.0 port can be used 4-6 and increase the recharging device. Power management is better than USB 2.0, thus supporting the idle, sleep and suspend. Edge USB 3.0 will be the same as USB 2.0 (standard), but the cable therein will be more, there are an additional four USB 2.0 channels compared to cable (a total of nine cable channels). USB 3.0 compatible with USB 2.0, so USB 2.0 devices will still be used in USB 3.0 port and will work with USB 2.0 standard speed. But not vice versa, a USB 3.0 device cannot be installed on a USB 2.0 port. 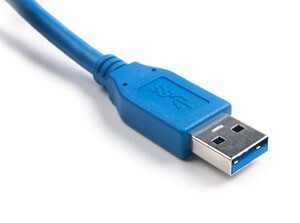 Windows Vista, Windows 7 and Linux already support USB 3.0, and Mac will soon follow. But for Windows XP until now there is no certainty whether there will be an update to this new interface. Maximum length of a USB 3.0 cable will be reduced to 3 feet (USB 2.0 up to 5 meters). While this can be overcome by adding a USB Hub. Not all devices can use a USB 3.0 full speed, such as magnetic hard disk is limited to the speed of rotation of the disk copies.